Do any of you remember this ICONIC graduation song that totally dominated the early 2000s radio? If I'm being honest, I'm equal parts filled with embarrassment (this song was my JAM!) and truly sweet nostalgia. Sometimes it's hard to remember what it felt like to be in high school. This song and music video bring me back to that ultra vulnerable moment when we were all desperately trying to hold on to our high school days and pretend like we weren't shi*%ing our pants thinking about college (or lack of college plans!). If you want to make this year special for your seniors, I've rounded up some great ideas, products, and projects that just might do the trick. Let us know in the comments below what YOUR favorite Senior Sendoff idea is! As much as I love/hate this song, it's so much fun to spoof :-) Show students the Vitamin C "Graduation Song" music video and teach a mini-lesson on parody. Divide your class into groups and make it a competition - the group to create the funniest parody of this video WINS! If you have some time and want to step up the rigor, require students to create scripts, storyboards, or other written elements to showcase their planning process. Either way, kids will get a kick out of poking fun at these cheesy graduation cliches. "Plan" a passing period where all of the seniors get to lay flat on the floor for nap time - they must be tired after four years of high school! Have a Silent DJ party during lunch hours. Seniors ONLY! On a day when seniors are out but underclassmen are still in classes, rent some blow-up slides/games and bouncy castles to play in while everyone else is still learning! Most high schools have a time in the day when they play, watch, or read school announcements, so why not dedicate one of those days to a senior goodbye video? We all love a good, sappy, cheesy video! Organize recording times about three weeks before you want to publish the video. I recommend getting a few teachers on board and making your classrooms available for recording during lunch hours. Have students record a 15-30 second goodbye video (thank a teacher, what they've gained, where they're going, etc.). Save all of the videos and then once all recording is finished, have your best video editor (student or staff member) put the clips together to make one final video as a gift to the senior class. This idea takes us back to the more academic side of ending a course with seniors. Yes, "senioritis" has kicked in, so what better time to do something active and focused on giving back to the community? Try one of my favorite units: Be the Change. This project walks students through five stages of identifying a social justice issue they care about, researching it, sharing what they've learned on social media, completing a service project, and then finally presenting on their hard work. 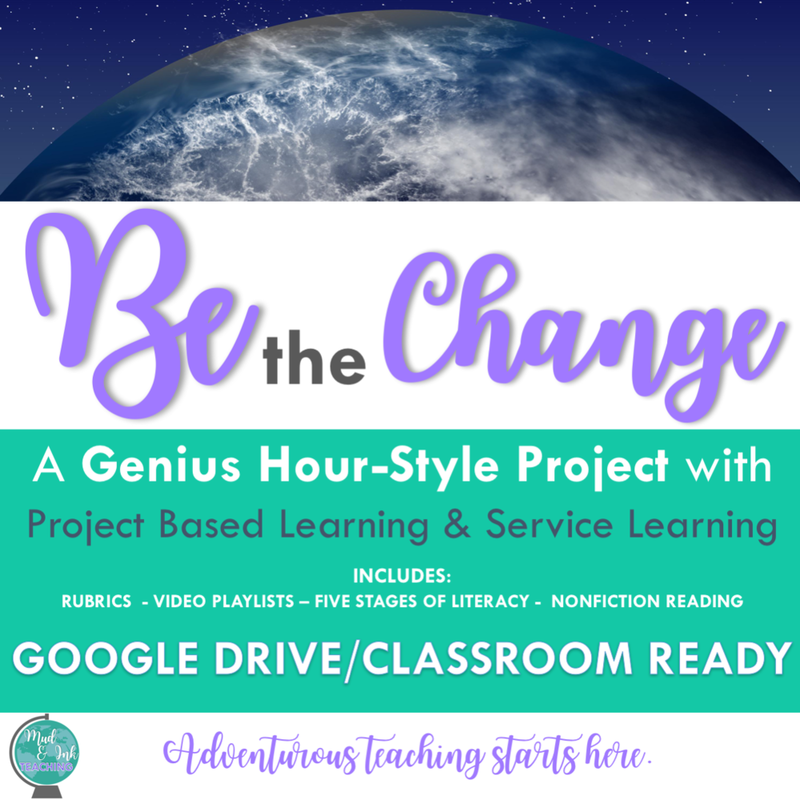 This project will keep students busy with nonfiction reading and research while also giving back to their community - what a better way to leave a legacy?! If there's a space in your school for everyone to participate in this huge idea, then go for it! On a simpler, more personal scale, however, every year I like to get a giant piece of butcher paper and give my seniors about three days to create a mural on paper of the most important things they've learned in English. I encourage them to collect the most memorable quotes from literature they can remember (so many of them remember things that I was certain they've forgotten! ), they draw characters and scenes, they use symbolism, and even a few inside jokes here and there. I keep these in the room year after year showing sophomores a glimpse into their own futures :-) When the mural is done, laminate it and hang it up in your room! Share with us in the comments below what your favorite traditions are with your senior sendoffs!